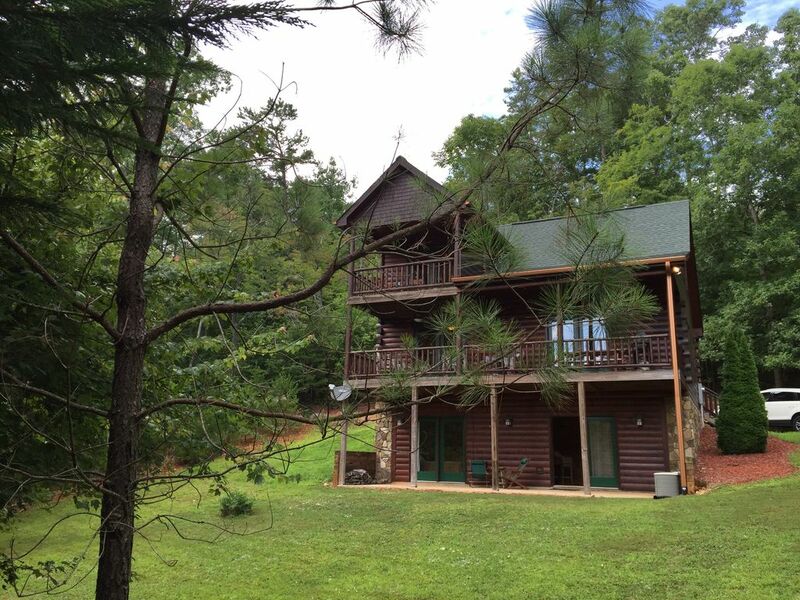 Short walk down the hill to stunning Lake Blue Ridge.... this well maintained log sided cabin is located in the desirable Aska Adventure Area and within a convenient 7 minute drive to historic downtown Blue Ridge GA. This well appointed cabin has mountain views on top level and three levels of finished living space all nestled on 1.75 wooded acres on a private dead end road. This cabin offers a 6 person hot tub, outdoor fire pit, game room in basement including pool table and foosball table. All rates include taxes and use of firewood(50.00 savings). Swimming and fishing are available within minutes of the cabin by either walking or driving. National Forest Service land is at the bottom of the foothill and it is used for swimming or fishing with little lake traffic. A public boat ramp is available as well. We had a 200 lb black bear in the yard in 2012 and we see deer, fox, turkey and rabbits all the time. If you stay two nights in APRIL/MAY, the cleaning fee is reduced by 29.00. Blue Ridge, GA is 90 minutes north of Atlanta, 20 minutes from the GA, NC and TN (where they meet) borders with hiking in the mountains, boating on Lake Blue Ridge (70% national forest), the Blue Ridge Scenic Railway in downtown Blue Ridge, trout fishing, whitewater rafting, the Ocoee River Olympic whitewater area is 30 min north in the mountains, the new Harrah's Cherokee Valley Casino in Murphy, NC is 30 min away and the famous Mercier Orchards is 2.5 miles north of Blue Ridge. Our daughters have grown up going to the Lake for the last ten years, we spend summer weekends on the boat and in the winter we love to hike and have a cozy fire in the mountains. We have watched downtown Blue Ridge become a destination for shopping, dining and entertainment. We love our weekend get away, we hope you enjoy it as much as we do! The cabin provides complete quiet and seclusion plus action fun in the Aska Adventure for everyone. Blue Ridge GA is 90 minutes north of Atlanta, 20 minutes from the GA, NC and TN (where they meet) borders hiking in the mountains, boating on Lake Blue Ridge (70% national forest), the Blue Ridge Scenic Railway in downtown Blue Ridge, trout fishing, whitewater rafting, the Ocoee River Olympic whitewater area 30 min north n the mountains and the new Harrah's Cherokee Valley Casino in Murphy, NC 30 min away. Loved our stay at the Yeagles. Kids loved the game room. Loved the privacy in basement. Wish the mattress was better. Had to move upstairs to bunk room after first night. But we made it work. Was overall such a beautiful relaxing stay. Close to lots of waterfalls,parks,Mercier apple orchard. We love going to blairsville, Hayesville and Helen. Wish we had a few more days. Didn't want to leave. Can't wait to stay here again. The Yeagles are quick to respond if needed help with anything. Thanks for sharing your little piece of heaven with our family. Thanks for the kind words, sorry the mattress didn't meet expectations. We are in the process of upgrading that queen to a king in the next 2 months. The owners were awesome to work with very informative. All the instructions were very helpful and beneficial. Place was a little hard to find at night. Had to light the pilot light on fireplace. These are the only 2 complaints/ issues. The place has a nice view and about a 10 minute ride to blue ridge. Also the unit is full of amenities. We will stay again. We thoroughly enjoyed our stay and the hospitality of the owners. Rental process was much easier than most and the owner was very responsive. Cabin was well equipped. Our only complaint (and nothing that would prevent us from renting again) was that there was no cable option on New Year’s Eve. We made due just fine though. Also wouldn’t recommend anything other than an SUV to get there. We will definitely be back!! Rough roads to get there but overall a nice cabin. Everything was clean and the cabin was very cozy and comfortable!! The stay at this cabin was amazing. Great views! Great house. This property was perfect for our get away. There was plenty of room for us and we could have invited a few more to join us without feeling cramped. The house is well stocked, there were plenty of supplies in Kitchen, bathrooms, and laundry room. We had fun playing foosball and pool downstairs. We enjoyed the indoor fireplace and outdoor fire pit. Every room had a scenic balcony. The beds were comfy; we all slept well and had plenty of extra blankets. The homeowner was easy to communicate with and gave excellent directions to the property. Overall, our experience was exceptional and we would definitely go back. Clean, roomy, close to town yet fairly secluded. Had a great time. Pretty mountains, in the woods, everything I expected it to be and more. Blue Ridge GA is 90 minutes north of Atlanta, 20 minutes from the GA, NC and TN (where they meet) borders ....with hiking in the mountains, boating on Lake Blue Ridge (70% national forest), the Blue Ridge Scenic Railway in downtown Blue Ridge, trout fishing, whitewater rafting, the Ocoee River Olympic whitewater area 30 min north n the mountains and the new Harrah's Cherokee Valley Casino in Murphy, NC 30 min away. Please be respectful of the neighbors, no smoking inside the cabin. Check out is 11am and check in is 4pm.